Adding a discriminator output to a Realistic PRO-62 requires some mechanical work this first time. The PCB that is visible after removing the back of the scanner needs to be removed. Loosen the screws and clear the PCB's connections of the BNC connector using a desoldering pump and/or desoldering braid (see the two arrows). The upper PCB can be removed, and the discriminator IC becomes visible. The discriminator IC is a DIL KA3361. 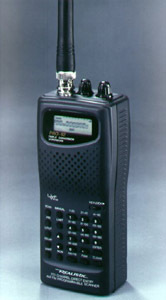 It is a clone of Motorola's MC3361. Pin 9 contains the unfiltered baseband audio. There is no need to solder to the KA3361. Test point 301 (TP301) is connected directly to pin 9. A miniature limiting resistor of 10 k is connected to TP301. A piece of insulated wire is connected to the other lead. At the back of the scanner, close to the BNC connector, I have put a female cinch connector. 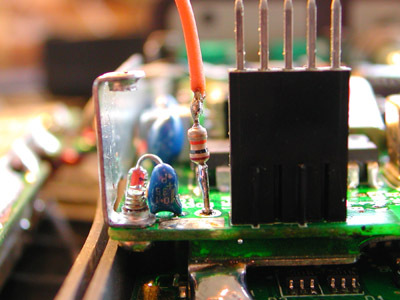 Using a 3.5 mm connector causes an inserted plug to touch the PCB, as there is not much clearance in the scanner. The inner conductor of the connector is connected to the wire coming from the 10 k resistor. 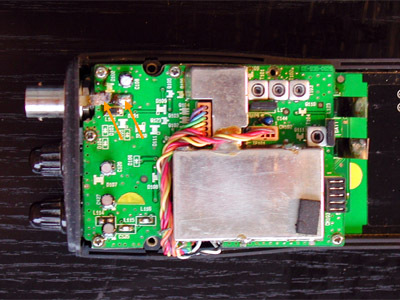 The outer lug is connected to the shield of the scanner, which is grounded. Because there is a 455 kHz IF component at the discriminator output, a capacitor of 2.2 n is connected across both contacts. Together with the 10 k resistor, it acts as a lowpass filter with a cutoff frequency of about 7 kHz. 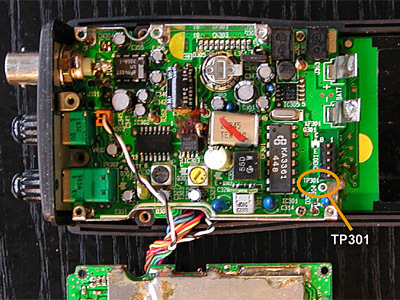 With some difficulty, TP301 is accessible without removing the top PCB. Now I know that TP301 has a direct connection to pin 9 of the IC, I'll probably try it this way the next time.